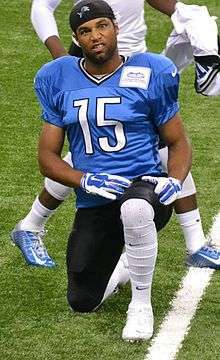 Golden Tate III (born August 2, 1988) is an American football wide receiver and punt returner for the Detroit Lions of the National Football League (NFL). He played college football at Notre Dame, where he was recognized as an All-American, and was drafted by the Seattle Seahawks in the second round of the 2010 NFL Draft. Tate was born in Hendersonville, Tennessee. He attended Pope John Paul II High School, where he played football, baseball and ran track. He rushed 140 times for 1,413 yards and 23 touchdowns as a senior in 2006 to go along with 28 receptions for 510 yards and six TDs. He also had three interceptions on defense, returned a kickoff for a TD and was the Knights' punter. He was named as a Tennessee Division II first-team all-state pick in 2006 as an athlete by the Tennessee Sports Writers Association and also by the Tennessee Football Coaches Association. After he injured his thumb his senior season and couldn't play baseball, Tate switched to track and field and posted the state's top qualifying times in the 100-meter dash (10.93 s) and 200-meter dash (22.33 s). He was also a member of the John Paul 4 × 100 m relay squad that captured the state title with a time of 42.86 seconds. Tate was drafted out of high school by the Arizona Diamondbacks in the 42nd round of the 2007 amateur draft. Tate did not sign with the Diamondbacks and instead played baseball for the University of Notre Dame. In Tate's freshman year at Notre Dame (2008), he played in 18 games and batted .262 with three doubles and three stolen bases. Tate hit his first home run against Louisville in Louisville, Kentucky in his sophomore year. He finished his sophomore season with a .329 batting average after playing in 55 games. Tate also scored 45 runs his sophomore year which is the third highest by any Notre Dame baseball player. On April 23, 2010, Tate was drafted by the Seattle Seahawks in the second round (60th overall) of the 2010 NFL Draft. On July 28, 2010, Tate signed a four-year deal with the Seahawks worth $3.261 million. During his rookie season in 2010, Tate caught 21 passes for 227 receiving yards. He also returned 16 punts and 1 kickoff for 212 total combined return yards. In 2011, Tate made 35 catches for 382 receiving yards and 3 touchdowns. Tate with the Seahawks in 2013. During the replacement referee controversy at the beginning of the 2012 NFL season, the Seahawks won a controversial game against Green Bay in Week 3, in which Tate pushed off of defender Sam Shields and was ruled to have caught a game-winning touchdown as time expired, despite Packers' safety M. D. Jennings assuming that he had also gained possession of the ball. During the broadcast, Monday Night Football announcer Jon Gruden expressed disbelief over the calls: "Golden Tate gets away with one of the most blatant offensive pass interference calls I've ever seen. M.D. Jennings intercepts the pass. And Tate's walking out of here as the player of the game. Unbelievable." The following day the NFL acknowledged that a joint catch was awarded to the offense and the touchdown ruling was correct, but officials said that an offensive pass interference penalty should have been called on the play. In week 10 against the New York Jets, Tate recorded his first passing touchdown to Sidney Rice on a receiver reverse pass. In 15 games Tate made 45 receptions for 688 receiving yards and 7 touchdowns. He also made 51 punt returns along with 3 kickoff returns for 642 total combined return yards. 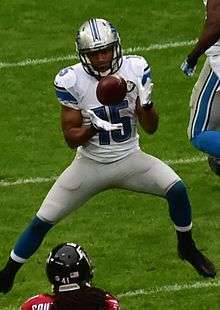 Tate with the Lions in 2014. Tate had a breakout season with the Seahawks in 2013. In addition to improving all of his receiving stats, Tate expanded his role by taking punt-receiving duties. He made some spectacular plays, notably a one-handed catch against the Atlanta Falcons as well as a crucial 71-yard punt return against the Tampa Bay Buccaneers, that highlighted his athleticism and special abilities. Pete Carroll, the Seahawks coach, said that he would not coach anyone else to do what Tate can do. During Week 7 against the St. Louis Rams, Tate was flagged for taunting following an 80-yard touchdown reception. Carroll chastised Tate after the penalty. On November 2, 2013, Tate was fined $7,875 for his taunting penalty. In the final game of the regular season, Tate produced one of his best games of the year, recording eight catches for 129 yards and a touchdown against the St. Louis Rams. Again, Russell Wilson threw a deep pass of 47 yards to Tate who caught the ball, and ran it for a touchdown similar to Week 7, minus the taunt, as the Seattle Seahawks beat the St. Louis Rams 27-9. Tate went on to win Super Bowl XLVIII as a member of the Seahawks. On March 12, 2014, Tate signed a five-year, $31 million contract with the Detroit Lions. The deal included $13.25 million guaranteed. He set a career high in receptions with 99, sixth highest in the NFL, and receiving yards with 1,331, seventh highest in the NFL. On January 19, 2015, Tate was selected to the 2015 Pro Bowl, his first Pro Bowl appearance. Tate and the Lions struggled in the first half of the season but gained momentum in the second half. Tate scored two touchdowns each in week 14 and 15, against the St. Louis Rams and New Orleans Saints, to bring his season touchdown total to six. In a week-9 game against the Minnesota Vikings, the Detroit Lions stormed back with 23 seconds left in regulation to tie the game at 16-16. On the first drive of overtime, Detroit marched down the field into field goal range. On 3rd down and long, Stafford threw a pass to Tate. He "flipped in" for the touchdown to give the Lions a 22-16 comeback win in overtime against the Vikings. He is the son of Golden Tate, Jr., a former wide receiver at Tennessee State who was the 120th overall pick in the fifth-round of the 1984 NFL Draft by the Indianapolis Colts. His brother, Wesley, was a running back for Vanderbilt University. 1 2 "Golden Tate". thebaseballcube.com. ↑ "Notre Dame's Golden Tate wins Biletnikoff Award". CNN. December 10, 2009. Retrieved May 3, 2010. ↑ Rosenthal, Gregg. "Tate leaving the Golden Dome, too". profootballtalk.nbcsports.com. December 7, 2009. ↑ "Seahawks agree to terms with Tate". Seattle Post-Intelligencer. July 28, 2010. Retrieved February 10, 2011. ↑ "Tate says he and Seahawks have reached deal; team mum". HeraldNet. July 29, 2010. Retrieved February 10, 2011. ↑ "Replacement refs rob Green Bay of victory after bizarre last-second Hail Mary". USA Today. September 24, 2012. ↑ Greenberg, Chris. "Seahawks Defeat Packers, 14-12: Disputed Replacement Referees' Call Results In Golden Tate TD (VIDEO, PHOTOS)". Huffington Post. Retrieved 18 December 2014. ↑ "Carroll trusts Golden Tate to take chances"